November is National Long-term Care Awareness Month! According to the National Institute on Aging, most long-term care is provided at home by friends and family. Taking on the care of a loved one can be a grueling, yet rewarding, task. As we age, we tend to need a little more help with everyday tasks. Eventually, some of us will find ourselves needing to be cared for by a close friend or family member. Many times, loved ones are taken in by children or grandchildren. It is often difficult to navigate this shift in the relationship. Consider a grandfather that spent decades caring for, teaching, and helping to raise his grandchildren. Now, he finds himself in a position where that grandchild that he cared for is now caring for him and his needs. While this sort of caretaker relationship is quite common in some cultures, for many elders the transition from an authority figure to a more subordinate role is a difficult one. Not that the caretaker role necessarily creates such a dramatic shift in power, but it can oftentimes be a big adjustment for all involved. Expect that there will be a lot of give and take on new household norms – discuss expectations and share non-negotiable and flexible rules (smoking, cleaning, groceries, bills, etc.). It takes time to adjust to the new family dynamic. We have all shared a household with others – whether as parent and child, roommates, significant others, etc. We can recall a period of time where the parties had to establish the new norms of the home. Determining who cooked or cleaned, whether certain items were off limits to the other, how to approach situations that disrupted one or the other, and establishing pet policies were often on the table for discussion. Are there quiet hours that need to be observed? What is the guest policy? 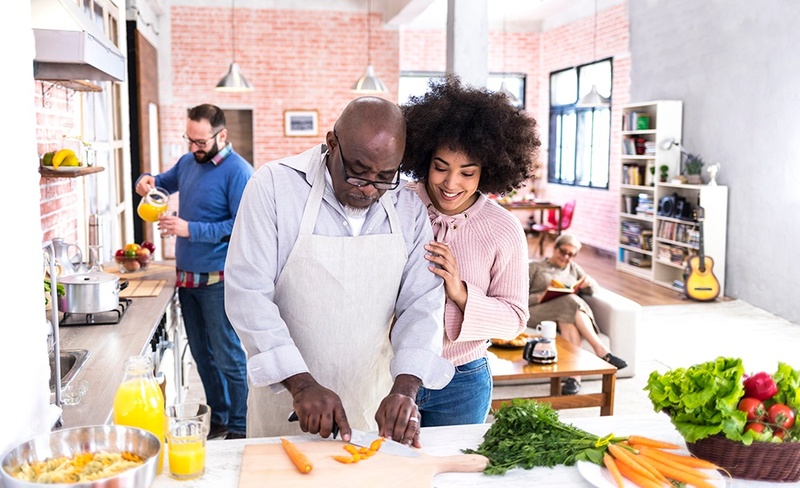 Many times, during the initial days or weeks after loved ones come into a caretaker’s home, therein lies a time where everyone is on their best behavior, the honeymoon period. Caretakers are especially keen to the needs and desires of the loved one. Loved ones are carefully learning the boundaries of the household that they have been introduced to, hoping not to disrupt the established family atmosphere. Visiting your child is much different from living with your child. During this time, both caretaker and loved one are learning the ins and outs of their roommate arrangement. Both are making determinations on the care needed and of boundaries that they will establish. After the first few weeks, the parties become familiar with each other’s habits and roles, and are more comfortable in their surroundings. Be honest about how much time the care of the loved one will impose. Seek out the help of other family members if it is unfeasible to take it on alone. Hire help if you can. Many caretakers underestimate the extent of the time commitment to successfully managing another adult’s care. Be realistic about the amount of time and effort required for the task. Of course, the seriousness of the loved one’s need for care will certainly impact these time-related responsibilities. Taking on the care of a grandfather, whose primary struggle is unmanaged diabetes, will take much less intervention than a bed-ridden grandfather with many complicated conditions. Time-related questions that a caretaker must ask themselves include: How will my loved one get to doctor appointments? Can I continue to work? Can they be left alone? Do they have the capacity to make an emergency call if needed? Will I need to learn any special medical skills for their care? Do I have the strength to assist the loved one in or out of the shower? What would I do to help them if they fall? Can they safely get downstairs to do their own laundry? The answers to these questions will help determine the caretaker’s required time commitment. Hammer out details for how long they may stay. It is important for caretakers to develop a plan of action for the care of their loved one. Is the arrangement permanent? Is the placement a medium between independent living and an assisted living or a nursing facility? Is the goal for the loved one to manage their own care in order to help them regain independence? The bounds of the relationship are an important part of taking on the care of another. It may seem obvious, yet there is often a gap between the expectations of the parties. Whether the plan is for the loved one to regain independence or if the plan is to be a bridge between independent and formal care, work toward this goal. Prepare the loved one for self-care techniques, getting medical conditions under control, making plans for budgeting for life expenses after they move out, or cover the details for their permanent stay. Sometimes, the caretaker expects the loved one to stay forever. Yet, the loved one hopes to move back out into the world once they have regained their strength or overcame an illness. Caretakers might be hesitant to permit reentry into independent living because they fear that the loved one will fall back into unhealthy or dangerous situations. We all need a little me time from now and then. Don’t be afraid to take a night off. Not only does this provide a respite for caretakers, but also for the loved one. Also, don’t forget that a loved one’s friends might like to visit or go out for a meal. Many communities also provide options for respite care, as well. Senior centers have plenty of fun activities to choose from! Beloved alone time often becomes a coveted commodity when caretakers bring loved ones into their homes. The family unit has expanded – the space becomes one person smaller and responsibilities become one person larger. Particularly in the case where the loved one no longer drives, he or she may be home more often than not. Many times, when they move to a caretaker’s home, the loved one loses the social community they once enjoyed where they had previously lived. Even more, both lose the uninhibited privacy that separate living once provided. When gathered with family and friends this holiday season, it may become apparent that long-term care is needed for a loved one. Being a caretaker can be a rewarding experience and can foster a cherished relationship between loved one and caretaker. Grandkids can get to know their elders better and these close bonds can provide life-long joy and support. While great consideration should be given towards long-term care options, it is often left to family and friends to provide the care an elder needs. Using the above tips, the in-home long-term care arrangement should make for a successful and enjoyable relationship. And a big “thank you” to all of our caregivers out there!